The users of our space have been lent an old-style analog organ. It is an Eminent Omegan 7100 from the 70's. The Dutch organ manufacturer Eminent (the company still exists) become famous when Jean Michel Jarre used the Eminent 310 Unique as the main instrument on his albums Oxygène and Équinoxe. The string section of that organ was the first commercial polyphonic string synthesizer, and the technology was licensed to ARP and become ARP/Solina String Ensemble, used pretty much by everybody in pop and rock in the 70's. 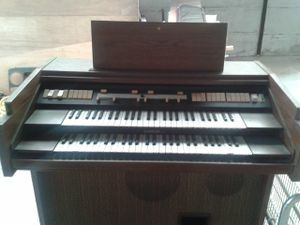 Our Omegan 7100 is a "practice church organ" model, so it has the church organ console, with 2 4.5-octave keyboards positioned straight above each other (rather than staggered by one octave as is usual on home/club organs). Circuits are a combination of analog (basic oscillators and filters), with 709/741 op-amps, and primitive digital (octave dividers). On first inspection, we found the circuit diagrams inside the organ. The 50 W amplifier and speakers seem to work, as you can hear the sounds from the spring echo when you turn up the volume, but the tone generators don't seem to work. More investigation (with a scope) needed. Switches and pedals seem to be in good condition, one key on the upper end of the bottom keyboard stands out, but is probably easy to fix. After some cleaning up and sorting out, most stuff works - part of the time. The master oscillator card seems to have a cold solder joint - the organ works if the card is tapped/pushed, but occasionally stops working and needs another push. As the board is hard-wired to the wiring harness (no connectors to fail!) access is a bit tricky, but half an hour of re-soldering all solder joints should do the trick. Both keyboards (manuals) work, pedals work, most registers/tones work, chorus effect, reverb and vibrato works, some of the slide pots need cleaning out and some contact spray. Restoring to full functionality is thus pretty straightforward, but the option of going steampunk "phantom of the opera" console is still a possibility. This page was last edited on 15 February 2017, at 03:31.